By steaming your lobster tails, you'll keep the meat tender and flavorful, and it's an easy way to get melt-in-your mouth lobster. It is also one of the quickest ways to cook lobster, as well as the most mess free. Steaming is also a great way to par-cook them before a quick turn on the grill. 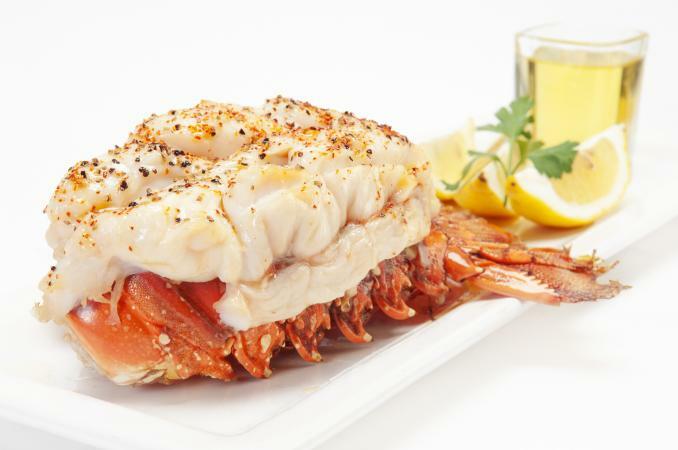 Lobster tail can be purchased frozen, fresh, or previously frozen. Typically, the thawed lobster found in most stores is previously frozen. Check with the fishmonger to be sure. If the tail is previously frozen, don't refreeze it. Refreezing will affect the flavor and texture of the lobster tail. To thaw a frozen lobster tail more quickly, you can place it in a sealed plastic bag and put the bag in a bowl full of cold water. Replenish the water frequently, until the lobster is thawed. Once the tail has been thawed, you will want to cook it the same day. Before you begin, it is best to take the lobsters mostly out of the shell. The tails will curl during cooking; however, you can prevent this by threading the tail with a wooden skewer prior to cooking. In a large pot that can be fitted with a steamer basket, bring four to five cups of water to a full boil. Place the skewered lobster tails in the steamer basket, and cover the pot. Steam the lobster for about 1/2 minute per ounce. The lobster will turn red and the flesh will turn white when done. When the lobster is done, run the steamer basket with the lobster in it under cool water to stop the cooking. Serve the tails with melted, clarified butter. If you'd like to make grilled lobster tails after steaming them in order to impart a smoky flavor, brush the steamed tails with clarified butter and grill for just a minute on each side. If you grill the lobster any longer than this, the meat will get tough and lose its delicate, sweet flavor. If you'd like to dress up your lobster a little bit, give this recipe a try. The lobster tail in this recipe is steamed in parchment, rather than in a steamer basket over boiling water. You can use this method for steaming lobster using other flavors like lemon, chardonnay and garlic. Cut out four pieces of parchment paper. On each piece of parchment, layer 2 slices of orange, a lobster tail, 1-1/2 teaspoons of butter, and a little of the fennel. Sprinkle each with salt. Pour 3 tablespoons of champagne over each of the serving packets. Fold the parchment around the ingredients, using folds to seal each packet closed. Put the packets on a baking sheet, and bake for 12 minutes. To serve, drizzle the tails with the juices from the packet and serve with melted butter. Try this full course meal, complete with wine pairings, for a classic, lobster-based meal at your next special occasion. For the first course, serve seafood appetizers and Champagne. Then serve lobster bisque and a delicious Roussane for the second course. Steamed lobster tails and spring greens with champagne vinaigrette and an oaked chardonnay could make up the third course. Finally, serve a fourth course consisting of crème brulée and Sauternes as dessert.